Fashion designers Marion Foale and Sally Tuffin formed a strong creative partnership in 1961. The clothes they made between 1961 and 1972 were always lively, fun and graphic. This summer dress, 'Carnival' was designed by Sally Tuffin and featured in the last Foale and Tuffin collection, 'Coco Frills' in 1972. It shows her love of bold colour combinations. The long dress, in blue and red cotton seersucker with printed polka dots, is teamed with a striped cotton bolero covered in polka dot frills. It could be worn from day to evening, from beach to informal party. Evening dress and bolero jacket in striped and polka dot cotton seersucker fabrics. Long sleeveless dress made from alternating pieces of red and blue seersucker with white polka dots, with a frilled collar and armholes. Co-ordinating sleeveless bolero jacket in multicoloured striped cotton seersucker with multiple ruffles in red, blue and yellow polka dots. Ties in the front with two sets of fabric ties. 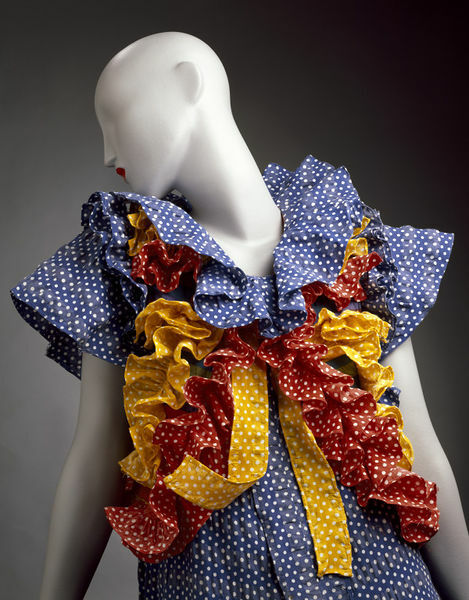 In 1972 Foale and Tuffin produced their circus-ring, primary coloured "Coco Frills" collection of spotted and striped seersucker garments covered with cascades of ruffles. From their shop off Carnaby Street, Foale and Tuffin provided young customers with lively clothes which often reflected current developments in the fine arts including Pop and Op Art. Their layered 'Romantic' clothes were particularly successful and reveal Foale and Tuffin's skill in mixing and matching printed fabrics and creative use of colour. Both designers graduated from the Royal College of Art in the 1960s. Their partnership lasted until 1972.